OK, I’ve gotten quite a few texts, emails and facebook messages, saying “I searched all over, and I can’t find a picture of your ring…I’m dying to see it” or just simply “I want to see your ring!” So I just figured that after two months with no one seeing a picture of it…I might as well just show it to you here! He did amazing…didn’t he???!!!! James custom made this ring for me. It took him almost 6 months for it to get perfected to the way he liked it, which ultimately was why it took him so long to propose and it makes it even that more special that he wanted it to be perfect. I love it! I seriously feel so blessed to have him in my life. Love it so much! He did great! beautiful. i love brilliant and oval cuts those are my favorite!! awesome. aww absolutely gorgeous! Good job, James!! =] Diana, I’m soo happy for the two of you! He did an amazing job!! It’s beautiful!! OMG!! This ring is gorgeous!! My boyfriend is looking at getting a ring custom made…can I ask where this was done at! Hi there! I just stumbled onto your ring on Pinterest and I must say it is stunning!! Where and how did he get the custom work done? I just love it! Thanks for sharing! Can you please let me know where you had this ring custom made? It is such an amazing ring! Can you PLEASE send a profile/side view???? Thank you sooo much! Hi! I have been obsessed with your ring for months after I found it on Pinterest! I’m looking to design something similar and was wondering if you could share who your (obviously amazing) husband designed it with? The craftsmanship is just gorgeous. Thank you in advance! Hi I Love this ring where did he go to get it made? Hey just wondering if you could sent me a side view of this ring. Very pretty!!! PLEASE PLEASE get back to me! It would gladly appreciate it!!! Thanks! I would love to see it as well! Please can I have side photos please?! Absolutely love this ring! In the designing process currently and would love to see profile view or any other photos. Very inspiring ring. Hi, I am also in the design process currently and would love to see what the ring looks like on your finger. Also what size is the diamond? My daughter is in love with this ring and we would love to get more info and pics of it. What kind of gold and a side view. 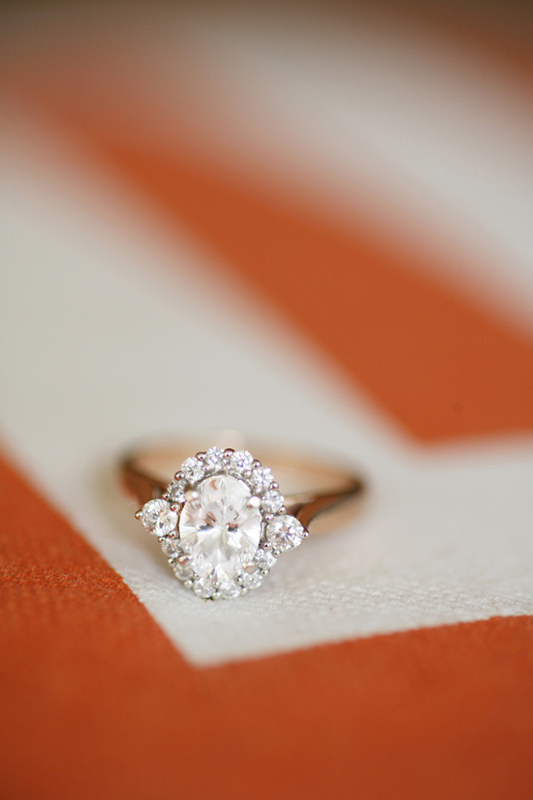 Your ring has been a big hit for many! This ring is absolutely beautiful. I would love to see more pictures and know through where it was designed! Hi, Please could you send any extra photos of this gorgeous ring to me? I’m also hoping to get this ring designed for my engagement and I would be so grateful if you could share it with me. * Is it a cluster or halo ring? * Is the band in yellow gold and the cluster / prongs in white gold? Please would you mind emailing me some other views of your ring? Side views perhaps? Also what size is the diamond in the center, and would you mind my asking what the total cost of the ring was? I want to see if it is feasible for us to recreate. Beautiful ring! I have never seen anything like it or anything as beautiful. I’m searching for engagement rings right now. Would you be willing to tell me what size the center and accent diamonds are, what kind of gold it is, and how much the total cost was? I’m trying to get ideas about what I would like. Also, do your diamonds have a white tint to them? They seem whiter that most, but maybe it’s just the picture coloring. This is gorgeous! Everything I’ve been looking for. Do you mind the questions? Size? Metal? Cost? Any further insight you have would be amazing. It’s truly special. Thanks! Wishing all the best. This may be the prettiest ring I have ever seen, so unique and timeless! Would you be able to give me some info as to the carat size and the jeweller used? Thanks and best wishes! !